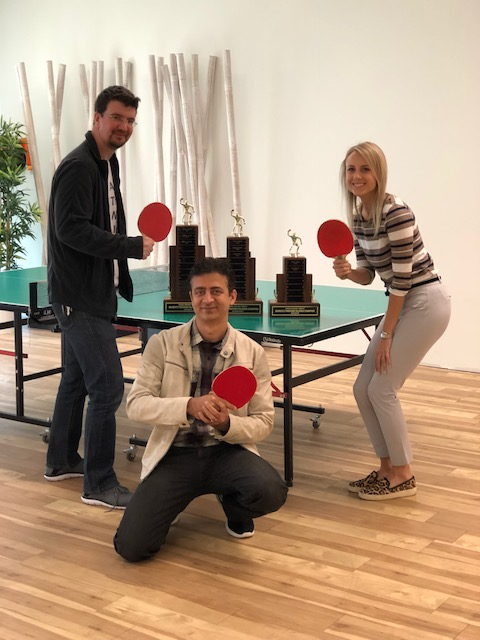 Ping pong has always been a big part of the fun-loving BigRentz company culture. Many team members enjoy letting off workday steam with a match during the day, their lunch hour or post-work. It’s an activity that brings together staff from various departments and allows the BigRentz family to get in some much-needed physical activity. Due to a universal love of this tabletop tennis game, BigRentz has hosted a ping pong tournament every November. This year’s tournament was the 4th Annual Ping Pong Palooza. The turnout was substantial, with 30 employees signing up to compete. There were three levels to the tournament (Beginner, Intermediate, and Advanced), the largest of which was the Intermediate bracket. The competition was fierce on all experience levels, with heated matches that often ended in alternating game wins, close scores and overtime points. The final match-ups consisted of Maryjane Clark and Taylor Litle in Beginner, Fil Covarrubias and David Hoffman in Intermediate, and Brett Howard and Prashant Wadhwa in Advanced. Maryjane and Taylor faced off in their first matchup of the tournament, which resulted in Taylor having to make her way back to the championship through the loser bracket. Maryjane, who was undefeated during the entirety of the tournament, continued her winning streak through the final match and won the Beginner championship. Fil and David had an excruciatingly close game, with each contestant alternatingly taking the first and second game. Ultimately, David came back with vengeance in the last game and won the Intermediate level. The Advanced level game was a very exciting match, which resulted in many BigRentz employees taking time to watch. There were intense slams and serves from both Brett and Prashant during the course of their two games. However, Prashant, who competes competitively outside of work, reigned supreme and took the Advanced champion title. Due to the exciting amount of participation of 2017’s Ping Pong Palooza, next year’s tournament will have four brackets: Beginner, Intermediate, Advanced, and Expert. BigRentz tradition dictates that the champion of each level must move up to the next experience tier the next year. We wish the best of luck to contestants in the 2018 BigRentz Ping Pong Palooza!